I would like to start by thanking the author for providing a copy of the Heart of Stone in exchange for an honest review. I would also like to mention that I alternated reading the ebook and listening to Adam Stubbs’s amazing narration (via Audible). Nine feet tall, four hundred-year-old and made of stone and magic, Task is one of the last Golems in the Realm and a powerful, nearly invincible war machine. Task is bought by the Truehards of Hartlund to help them win a nine-year civil war opposing the king and his nobility (the Truehards) to a group of former councilors, merchants and workers calling themselves the Last Fading. Despite being alien, feared, and even hated, the Wind-cut Golem is Hartlund’s last hope. But what if Hartlund’s war fulfills Task’s secret hope to finally find purpose, redemption or peace? I’m so glad I gave Ben Galley’s story a go. I didn’t get the opportunity to read many self-published books so far but I’m convinced regardless, from my limited experience and mostly from the multiple experiences of trusted friends, that the Heart of Stone is a little gem in the lot, for multiple reasons. For one thing, Galley’s writing is quite good. I expected typos and perhaps some awkward turns of phrases. Instead, I found the writing extremely polished and really beautiful in places. But I shouldn’t have been surprised by the “polished” part, considering that the writer is also a self-publishing consultant who helps new authors publish their books. More than the form however, it was his way with words that made Galley’s story compelling for me. Now a lot of people might be deterred by the pacing of this book. I can’t really blame them, as the first half or so was pretty slow and though a few battles were fought, there wasn’t enough context to make them particularly impactful or distinguishable from one another. However, I felt that slowness was necessary because it allowed Galley to give a lot of substance to his characters and to learn a great deal about their pasts (especially Task and Alabast, the legendary Knight of Dawn, tasked by the Last Fading to defeat the Golem). He told me the reason we humans struggle and fight is because we know the only immortal part of our mortal selves is our names. I also found it extremely refreshing to be in the head of a sentient golem, capable of feeling and thinking but with limited needs, desires and freedom. Some readers might feel Task was too “human” but his way of thinking felt pretty different to me, primitive somehow and even simplistic. I loved to learn more facets of him and I was glad that despite the tremendous growth he underwent, that development felt honest and consistent. And that applies for pretty much every other character in the book in my opinion. Galley also put a lot of emphasis in the interactions between his characters and I think that’s what I loved the most in this book. The relationships Task formed, so varied and so different from the coldness, mistrust and hate he’s known for centuries, were complex and progressive as well as beautiful life lessons. Ideas were living things. They exploded into being, having evolved with time. They could blaze brightly or sour and wither away, like life. Because, like all life, ideas need to be fed to survive. 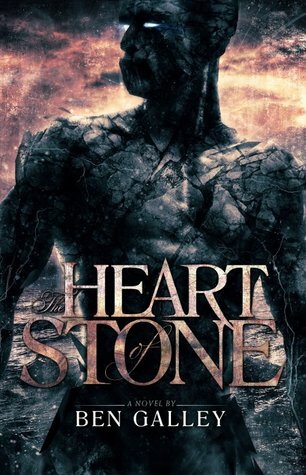 But despite all the things I liked about the Heart of Stone, two things prevented me from giving it a full 4 stars rating or even 5 stars: unexplained events and the worldbuilding. Firstly, two decisive events happened off-screen. Missing the first was okay, even though it would have added welcome action sequences. The second however was really a shame because witnessing it would have given so much more impact and closure to the story. As for the worldbuilding, most of the first half of the book lacked context and I was pretty lost and frustrated at the beginning. The good news however is that almost every question I had has been answered and every contradiction or what I considered to be a plot-hole was addressed in the most suitable moment, which allowed for a few revelations and suspenseful occurrences. Most of the worldbuilding came from the excerpts that opened each chapter and the flashback dreams Task had. And they did provide a lot of information about the different kinds of “old magic”, the religion and the history. But I would have liked some information to be incorporated in the story and not just provided in a concise and sometimes enigmatic way. However, I have to give a special mention to the original elements introduced in this world and that added an additional fantastic touch: animals, seasons and months, magical trees and moon/star systems! Finally, I would have loved to learn more about the different kinds of magics the Mission (the church) has been guarding jealously and about the Windtrickers and how Golems were built. Ben mentioned in his acknowledgements that he might be visiting the Realm again with either a sequel (following the story of one of the major characters) or a prequel about a younger Task. So I’ve got the hope we might learn more about the old magic. Before I conclude this review, I’d love to mention the audiobook and the amazing job Adam Stubbs did. I don’t have a big experience with audiobooks yet but I really, really loved how Adam interpreted the characters and the different accents, voices and even personalities he gave them. Hell, I couldn’t even understand how Task was supposed to sound. I mean how do you begin to imagine how “two rocks grinding together” might produce words and thoughts? Well, Stubbs did it in an almost natural and pretty convincing way! I hope your throat didn’t ache too much afterwards, dude! He also gave Alabast a great voice and I got a definite “Inigo Montoya” feel from him, not only because of his drinking issues, dueling skills and tortured past, but mainly from the accent and the funny way he delivered his retorts! The Heart of Stone is an original, gripping and a genuinely human tale. I won’t lie, this was a slow book but I could feel the dedication and the authenticity Ben Galley put in his characters and their relationships. I would have loved a longer book, with more action scenes and more detailed explanations about magic and history but I can’t deny how much I enjoyed this book and the peculiar atmosphere it had. If you’re a lover of character-driven stories interspersed with gory battles scenes, scheming, secret agendas and an original approach of war, this book is for you! Oooh. Your first book… Bestseller coming up!